R is now able to say blue and will copy me when I say it. Practicing vocabulary words during activities is a great way to build word and object associations. I try to choose just a couple of vocabulary words per day. I had provided R an invitation to play with a wooden tray and the foam colour mats we’ve been using all week, containers, play dough, gears and q-tips. R did the cutest thing with the play dough and q-tips. After putting the q-tips into the play dough, like I had shown her, she plopped the creation onto a coloured container and started singing the word, “happy”. This is her way of saying happy birthday. R has great imagination since she was able to combine her past experiences with birthdays and see that the q-tips in the play dough resembled a birthday cake. She even practiced blowing out the “candles”! 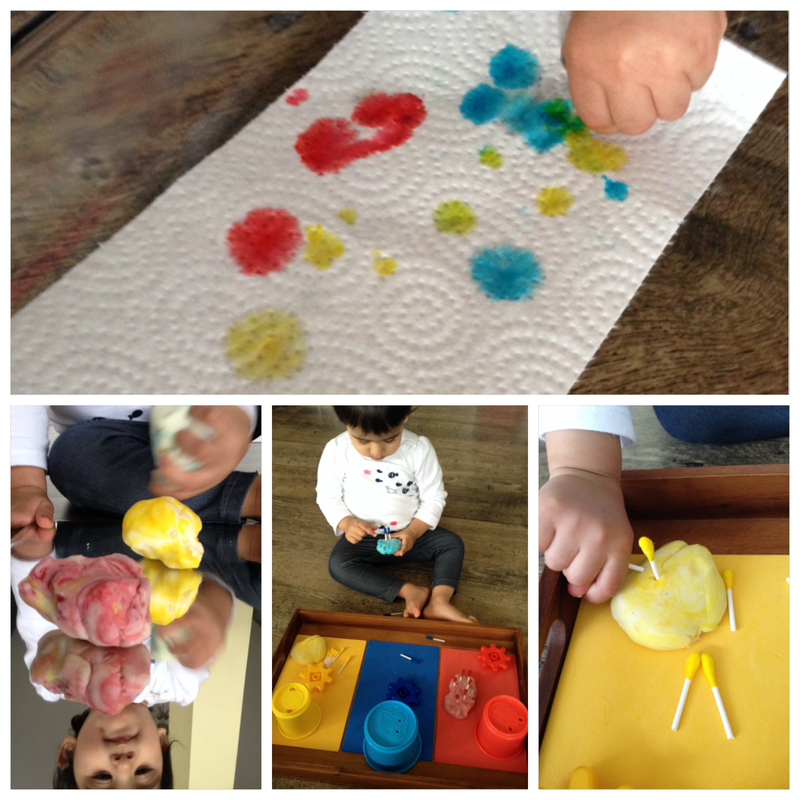 Finally, we used the q-tips, which I had coloured with food colouring, to paint on paper towel. We dipped the coloured q-tips in some water so that the colours would flow more easily into the paper towel. This will be a great activity to repeat with R as she gets older and starts learning about colour mixing!